Hazardous materials are substances “capable of posing unreasonable risk to health, safety and property” 949 CFR 171.8. Hazardous materials (commonly known as hazmat) are regulated by a number of federal agencies, including the Department of Transportation (DOT), Environmental Protection Agency (EPA), Nuclear Regulatory Commission (NRC), and Occupational Safety and Health Administration of the Department of Labor. In addition, the Coast Guard and Federal Emergency Management Agency of the Department of Homeland Security have responsibilities for emergency response to hazmat incidents. Because these agencies have different responsibilities, they have correspondingly different definitions of hazmat. Hazmat regulations cover a wide range of issues, but this entry focuses on emergency response to unplanned releases that pose a threat to the general public. Thus, this entry does not address the management of chronic chemical pollution under the Toxic Substances Control Act and Pollution Prevention Act; hazardous waste under the Resource Conservation and Recovery Act; hazmat cleanup under the Comprehensive Environmental Response, Compensation, and Liability Act; protection of workers engaged in hazardous waste operations and emergency response or oil spill preparedness and response under the Oil Pollution Act; and the Spill Prevention, Control, and Countermeasure Rule. Emergency response to hazmat incidents has long been recognized to be a responsibility of local emergency responders in public safety agencies such as fire and police departments. These agencies can provide a satisfactory response to minor incidents, especially when they follow the DOT’s Emergency Response Guidebook (DOT 2016) in making protective action decisions. However, the 1984 toxic chemical release in Bhopal India called attention to the need for comprehensive planning involving cases of major releases. Thus, the 1986 Emergency Planning and Community Right to Know Act (EPCRA, also known as Title III of the Superfund Amendments and Reauthorization Act – SARA Title III) required each state to establish a State Emergency Response Commission (SERC) and Local Emergency Planning Districts, each of which would have a Local Emergency Planning Committee (LEPC). LEPCs are expected to work with local facilities that are storing more than the maximum allowable amount of chemicals designated by the EPA as extremely hazardous substances (EHSs). Specifically, this collaboration requires identifying the EHSs stored onsite and the quantities of those substances. In addition, it requires computing the radius of vulnerable zones (VZs) around the facilities and developing plans for responding to releases of those EHSs (NRT 1988, 2001). In the longer term, local jurisdictions should promote safe land use practices to ensure that high-density residential and commercial land uses are located outside the VZs for fixed-site facilities and are adequately separated from transportation routes where high volumes of hazmat are carried. High priority should be given to facilities, such as schools, hospitals, and nursing homes, that house vulnerable population segments lacking physical mobility or ready access to evacuation vehicles (see “Emergency Management: Evacuation”). Local jurisdictions should also work with energy utilities to encourage the reduction of air infiltration in new structures and retrofits of existing structures because this will save energy in the short run and also support sheltering in-place during a hazmat release (see “Emergency Management: Shelter In-Place“). Planners typically expect to find hazmat produced, stored, or used at fixed-site facilities, such as petrochemical and manufacturing plants, but these materials are also found in warehouses (e.g., agricultural fertilizers and pesticides), water treatment plants (chlorine is used to purify the water), and breweries (ammonia is used as a refrigerant). Moreover, hazmat is transported from one location to another by a variety of modes – ship, barge, pipeline, rail, truck, and air. In general, the quantities of hazmat on ships, barges, and pipelines can be as large as is stored at many fixed-site facilities, but usually the amounts are smaller for other modes of transportation, decreasing in size from rail to truck to air. Small- to moderate-sized releases of hazardous materials at fixed-site facilities are occupational hazards but often pose little risk to public health and safety because exposure resides entirely within the facility boundaries. However, releases of this size during hazmat transportation can be a public hazard because passersby can easily enter the risk area and become exposed. The amount actually released is often much smaller than the total quantity available in the container, but prudence dictates that planning processes assume the plausible worst cast of complete release within a short period of time (e.g., 10 min in the case of toxic gases). There are thousands of chemicals in commercial use, but they can be categorized into nine classes based on their chemical and physical properties. Explosives cause casualties and property damage by overpressure from atmospheric blast waves and flying debris. Destructive effects from quantities found in transportation can be felt as much as a mile (1.6 km) or more away from the incident site. Flammable gases such as liquefied petroleum gas (LPG) can travel downwind after release until they reach an ignition source, such as the pilot light in a water heater or the ignition system in a car. At distances of 0.5 miles (0.8 km) or more, the gas cloud can erupt in a fireball that flashes back toward the release point. Explosive rupture of gas containers can launch fragments up to 1 mi (1.6 km), so evacuation out to this distance is advised if there is a fire. Flammable liquids, such as gasoline, present a similar threat as flammable gases, in that a volatile liquid (one that rapidly produces much vapor) can travel toward an ignition source and erupt in flames when an ignition source is reached. When a flammable liquid is dispersed on land, there should be a downwind evacuation of at least 0.2 mi (0.3 km). A flammable liquid that floats downstream on water could be dangerous at even greater distances. A fire should stimulate consideration of an evacuation of approximately 0.5 mi (0.8 km) in all directions. Flammable solids are less dangerous than flammable gases or liquids because they do not disperse over such wide areas. A large spill requires a downwind evacuation of 300 ft (0.1 km), but a fire should produce an evacuation of 0.5 mi (0.8 km) in all directions. These substances do not burn but are hazardous because they promote combustion. A large spill should prompt a downwind evacuation of 0.3 mi (0.5 km), and a fire should initiate an evacuation of 0.5 mi (0.8 km) in all directions. Toxic (poisonous) materials are hazardous when inhaled into the lungs, ingested into the stomach by means of contaminated water or food, or absorbed through the skin. Of these exposure pathways, inhalation hazard is typically the greatest concern because high concentrations can kill in a matter of seconds. Moreover, chemical contamination of victims could pose problems for volunteers and professionals providing first aid and transporting victims to hospitals. These chemicals vary substantially in their volatility and toxicity, so protective action distances following a spill or fire during a transportation incident must be determined from the Table of Protective Action Distances in the Emergency Response Guidebook. Protective action distances for releases from fixed-site facilities are more complex and are addressed below. Infectious substances have rarely been significant to date, but the potential for large-scale terrorist attacks should be of concern to emergency planners. With the exception of nuclear power plants, the planning for which is supported by guidance from NRC (1980), releases of radioactive materials are likely to involve only small quantities. Nevertheless, even a few grams of a lost radiographic source for industrial or medical X-rays can generate a high level of public concern. Here also, the recently recognized threat of terrorist attack from a “dirty bomb” that uses a conventional explosive to scatter radioactive material over a wide area deserves planners’ attention because of the potential for long-term contamination of central business districts. A large spill should prompt a downwind evacuation of approximately 300 ft (0.1 km), and a fire should initiate an evacuation of approximately 0.2 mi (0.3 km) in all directions. Corrosive materials, which can be either acidic or alkaline, cause chemical burns, but the substances in this class that are most frequently used and transported are not highly volatile. Thus, the geographical area affected by a spill is likely to be no greater than approximately 300 ft (100 m) unless the container is involved in a fire or the hazmat enters a waterway (e.g., via storm sewers). These chemicals vary substantially in their volatility and toxicity, so evacuation distances following a spill or fire must be determined from the Table of Protective Action Distances in the Emergency Response Guidebook. This class comprises a diverse set of materials such as air bags, certain vegetable oils, polychlorinated biphenyls (PCBs), and white asbestos. Materials in this category are low to moderate fire or health hazards to people within 30–80 ft (10–25 m). The spread of an airborne release is defined by the hazmat’s chemical and physical characteristics, its release characteristics, the topographic conditions in the release area, and the meteorological conditions at the time of the release. A hazmat’s chemical and physical characteristics are its volatility (the rate at which the chemical becomes airborne per unit of time), buoyancy (whether it tends to flow into low spots because it is heavier than air), toxicity (the biological effect due to cumulative dose or peak concentration), and physical state – whether it is a solid, liquid, or a gas at ambient temperature and pressure. Release characteristics are defined by the chemical’s temperature and pressure in relation to ambient conditions, its quantity (measured by the total weight of the hazmat released), its release rate (in pounds per minute), and the surface area of the spilled pool if the substance is a liquid. Temperature and pressure are important because the rate at which the chemical disperses in the atmosphere increases when these parameters exceed ambient conditions. The release rate is important because it determines the concentration of the chemical in the atmosphere. Specifically, a release rate at the high end puts a large volume of chemical into a given (limited) volume of air, thus increasing its concentration (the amount of chemical divided by the volume of air in which it is contained). Topographical conditions relevant to liquid spills or dense gases are the slope of the ground and the presence of depressions. Steep slopes allow a liquid to rapidly move away from the location of the spill. Both flat slopes and depressions decrease the size of a liquid pool’s surface area and, in turn, reduces the rate at which vapor is generated from it. Thus, hazmat facilities erect permanent dikes around chemical tanks to confine spills in case the tanks leak and hazmat responders build temporary dikes around spills for the same reason. Topographical characteristics also affect the dispersion of a chemical release within the atmosphere. Hills and valleys are land features that channel the wind direction and increase wind speed at constriction points – for example, where a valley narrows and causes wind speed to increase due to a “funnel” effect. Forests and buildings are rough surfaces that increase turbulence in the wind field, causing greater vertical mixing that dilutes the chemical’s concentration in the atmosphere. By contrast, water bodies are smooth surfaces that produce minimal wind turbulence, thus allowing the hazmat to maintain a high concentration at ground level where people inhale it. The meteorological conditions of concern during a hazmat release are wind direction, wind speed, and atmospheric stability. The effect of wind speed on atmospheric dispersion can be seen in Fig. 1, which shows a release dispersing uniformly in all directions when there is no wind (Panel A). Thus, any plume isopleth (contour of constant chemical concentration) for this chemical is a circle. The nearby town lies outside the plume so its inhabitants would not need to take protective action. However, Panel B describes the situation in which there is a strong wind, so a plume isopleth for this case is an ellipse. In this case, the nearby town lies inside the plume so people there would need to take protective action. As Table 1 indicates, atmospheric stability can vary from Class A through Class F. Class A, the most unstable condition, occurs during strong sunlight (e.g., midday) and light wind. This dilutes the released chemical by mixing it into a larger volume of air. Class F identifies the most stable atmospheric conditions, which take place during clear nighttime hours when there is a light wind. These conditions have very little vertical mixing, so the released chemical remains highly concentrated at ground level. It is important to recognize that, at some times, meteorological characteristics can remain stable for many days but, at other times, can change from 1 h to the next. Figure 2, which Lindell et al. 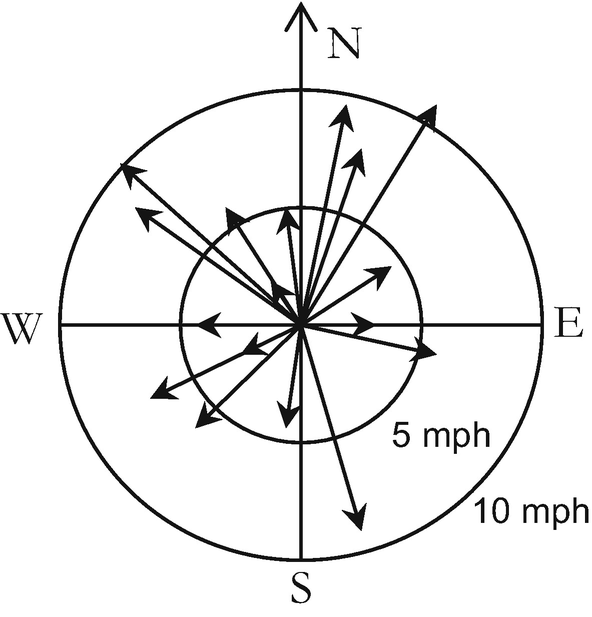 (2006) adapted from McKenna (2000), displays the wind direction at each hour during the day of the 1979 accident at the Three Mile Island nuclear power plant in terms of the orientation of an arrow. Wind speed is indicated by the length of the arrow. The figure shows wind speed, and direction changed repeatedly during the course of the accident, so any recommendation to evacuate the area downwind from the plant would have referred to different geographic areas at different times during the day. This would have made evacuation notices extremely problematic because the time required to evacuate these areas would have taken many hours. Consequently, while the evacuation of one area was being implemented, the second order to evacuate in a very different direction would be issued, requiring simultaneous evacuations. The process of identifying VZs around hazmat facilities begins by identifying dangerous chemicals (i.e., those that are threats because of their flammability, reactivity, or toxicity), their locations, and the quantities stored at those locations. Once the chemical inventory has been conducted, VZs can be computed using the data on the chemical’s quantity available for release, the type of spill (liquid or gaseous), and the postulated release duration (e.g., 10 min) – all of which are combined to estimate the release rate. In addition, the VZ is defined by the chemical’s toxicity, the assumed meteorological conditions (wind speed and atmospheric stability), and the terrain (urban or rural). Available methods for VZ computation are manual computations in the Technical Guidance for Hazards Analysis (USEPA 1987), desktop computations using CAMEO/ALOHA (FEMA, no date, see www.epa.gov/cameo), or online computations using RMP*Comp (www.epa.gov/rmp/rmpcomp). Emergency planners can use the Technical Guidance for Hazards Analysis to calculate the size of the VZ for EHSs by identifying the number of pounds of hazmat in a tank or system of interconnected tanks (obtained from the facility operators) and the level of concern (LOC – the minimum concentration at which adverse health effects could occur – which is listed in an appendix to the Technical Guidance). These data are used to enter one of four tables defined by the type of terrain (urban or rural) and atmospheric conditions at the time of the release (moderately stable or extremely stable). For example, the release of 800 lbs of chlorine (LOC = 0.0073) over a 10-min period from a water treatment plant located in a rural area during extremely stable atmospheric conditions and a wind speed of 3.4 mph (5.4 kph) would have a VZ radius of approximately 10 mi (16 km). If the plant were located in an urban area, the same scenario would result in a VZ radius of only about 1 mi (1.6 km) because the presence of buildings produces greater terrain roughness and, thus more vertical atmospheric mixing, than is found in rural areas. Once the radii of the VZs for the different chemicals have been computed, these can be overlaid onto a map with the release point in the center of the circle and the radius drawn around it (see Fig. 3). The VZ around a fixed-site facility is a circle because a toxic chemical plume – which is usually elliptical in shape – could travel in any direction from the plant depending on wind direction. The VZs can then be used to identify areas within a jurisdiction that require hazard mitigation and emergency preparedness actions to protect the public health and safety, property, and the environment. Emergencies in hazmat transportation not only involve much smaller quantities of hazmat than at fixed-site facilities but, when they occur in populated areas, threaten local populations so quickly that emergency responders lack the time to perform the computations used for fixed-site facilities. Emergency planners should begin by identifying the highway, rail, water, and air routes through which hazardous materials are transported before an incident occurs. Once these routes have been identified, the number of tank trucks, railroad tank cars, and barges carrying each type of hazardous material can be counted in a commodity flow study. Information about hazardous materials transportation can be found on the DOT website (hazmat.dot.gov), and specific guidance for commodity flow studies is found at https://www.phmsa.dot.gov/technical-resources/hazmat-technical-resources/guidance-conducting-hazardous-materials-flow-studies. Once the chemicals being transported have been identified, analysts can use the same procedures that were used for fixed-site facilities. 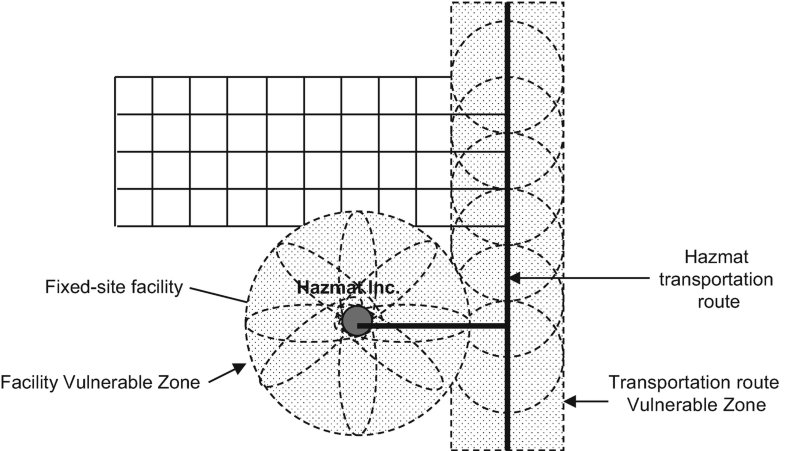 A hazmat release can take place at any point along a transportation route, so its VZ is defined by a series of circles whose radius is calculated in the same way as for a fixed-site facility. Thus, the VZ for a transportation route forms a rectangle (see Fig. 3). The fixed-site facility and transportation route VZs can then be examined to identify areas of residential, commercial, and industrial land use (see Lindell et al. 2018, chapter 11, for an analysis of hazardous waste transportation to an incinerator). If VZs for the transportation routes have not been identified before an incident occurs, local emergency responders need to search the incident scene for shipping papers, a numbered placard, or a placard with an orange numbered panel to obtain either the hazmat’s name or its ID number so they can identify the correct section of the Emergency Response Guidebook (www.phmsa.dot.gov/hazmat/erg/erg2016-english). This document identifies these chemicals’ potential hazards (fires, explosions, and toxic exposures), recommended response actions by firefighters and hazmat technicians, appropriate protective actions for emergency responders and the public, and recommended first aid measures for those who have received excessive exposures. For chemicals posing the greatest inhalation hazard, the Emergency Response Guidebook directs emergency responders to a Table of Initial Isolation and Protective Action Distances that should be used to select the appropriate protective action recommendations. These protective action distances are the equivalent of VZ radiuses for “small” and “large” spills during daytime and nighttime conditions. For a nighttime release of chlorine, the protective action distances would be 0.5 mi for a small release and 1.9 mi for a large release. Because the Emergency Response Guidebook classifies releases only as small or large, emergency planners should use the procedures in the Technical Guidance for Hazards Analysis or more advanced methods identified in the Handbook of Chemical Hazard Analysis Procedures wherever possible. 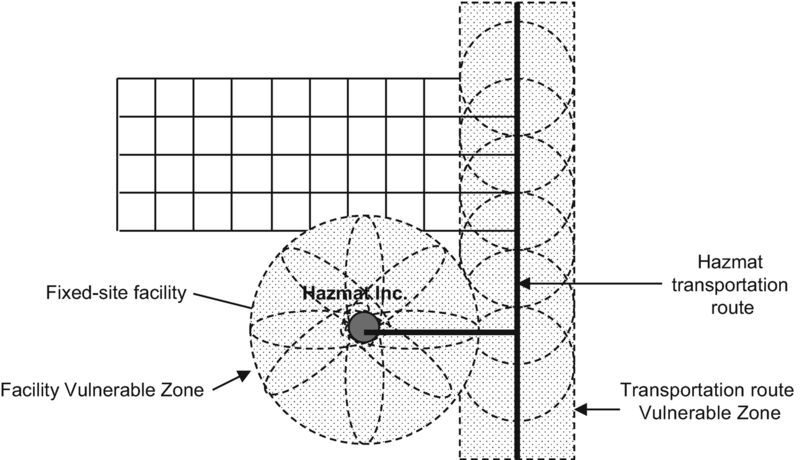 In particular, the protective action distances in the Emergency Response Guidebook are not appropriate for use in computing VZs for fixed-site facilities. Exposure pathways for radiological materials are similar to those of toxic chemicals. Breathing air that is contaminated with radioactive materials can cause inhalation exposure, whereas eating food (e.g., unwashed local produce) or drinking liquids (e.g., water or milk) that is contaminated can cause ingestion exposure. Contamination also can enter the body through an open wound, such as a compound fracture, laceration, or abrasion, but radiological materials do not cause absorption exposures because they do not pass through the skin. However, because radiological materials release energy, they can produce exposures via direct radiation (also known as “shine”) from a plume that is passing overhead. If the plume has a significant component of particulates, these might be deposited on the ground, vegetation, vehicles, or buildings, and the direct radiation from the deposited particulates would produce a continuing exposure. In this connection, it is important to recognize the distinction between irradiation and contamination. Irradiation involves the transmission of energy to a target that absorbs it, whereas contamination occurs when radioactive particles are deposited in a location within the body where they provide continuing irradiation. The NRC conducted extensive analyses to define the emergency planning zones (EPZs) that should be designated around these facilities. These analyses led to the establishment of a 10-mile radius plume inhalation EPZ in which people might need to initiate protective actions to avoid inhalation exposure and direct radiation from a radioactive plume (NRC 1978). Protective actions within the 10-mile EPZ are expected to include sheltering, evacuation, and the use of potassium iodide. In addition, there is a 50-mile radius ingestion pathway EPZ in which authorities should prepare to monitor water, milk, and food (especially leafy green vegetables) for contamination. Within the 50-mile radius, actions include bans on contaminated food and water (NRC 1980). The Emergency Response Guidebook provides adequate guidance on the selection of protective actions for hazmat released during most transportation incidents. Such incidents can involve any one or more of a diverse set of chemicals, but the quantities tend to be small so protective actions are often – but not always – limited to the immediate vicinity of a release. However, incidents at fixed-site facilities can be much larger – sometimes affecting people 10 miles (16 km) or more downwind. Consequently, it is important for local emergency planners to know which facilities have hazmat and what are the quantities of hazmat that are stored at each facility. In addition, planners need to identify the VZs for each of the EHSs at these facilities and to develop emergency response plans that address protective actions such as evacuation or sheltering in-place. This research was supported by the National Science Foundation under Grants IIS-1540469, CMMI-1760766, and CMMI-1826455. None of the conclusions expressed here necessarily reflects views other than those of the author.